We are passionate about creating items you love! Every item from Qualtry is uniquely personalized just for you. Each and every one of us at Qualtry love to create, and are anxious to create something special for you! 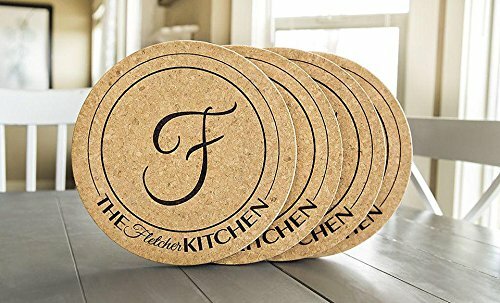 Our personalized jumbo cork trivets are not only the trivet you will reach for time and time again; they are also the perfect decor for your kitchen. These trivets are beautiful enough to use on your dining room table and every one that sees them wants one of their own. Choose from stunning engraved designs, click the Customize Now button and provide your personalization info. These specially made trivets are big enough for your largest pot of soup, yet so versatile that smaller items look stylish on them as well. The jumbo cork pads make superb and much-appreciated wedding, Mother's Day, birthday, and housewarming gifts. Don't forget to order a set for yourself. The cork trivets for hot dishes are made from 100% solid cork and measure 11.5-inch diameter and 3/4-inch thick. Protect your counters from hot items and then display them as a lovely centerpiece in your kitchen when not in use. If you have any questions about this product by Qualtry, contact us by completing and submitting the form below. If you are looking for a specif part number, please include it with your message. Q's INN Silicone Trivet Mats | Hot Pot Holders | Drying Mat. Our 7 in 1 Multi-Purpose Kitchen Tool is Heat Resistant to 440°F, Non-slip,durable, flexible easy to wash and dry and Contains 4 pcs.